We’ve been officially homeschooling for over 2 months. Wow, I never thought I would say that. If you’ve been following my blog for awhile, you know I’ve been teeter tottering on this issue for some time. My hearts desire was to homeschool but the desire of my flesh kept telling me I didn’t have the time. After little brothers incident, God completely confirmed that this was His path for my family. I wanted to give you a little insight into why we started on this journey but before that please know that regardless of whether you homeschool or not, we each have a different path and plan in life and no one way is better than another. Before big brother turned five, I wanted to homeschool my son. Since he was two, we’ve been gardening, cooking, and taking pictures together. He’s his dad’s little mechanic and “gopher” for all of our home projects. Our family has been one to always include our little guys in whatever diy project we’re currently involved in. Homeschool seemed to meld perfectly as we adore being with our children but the time and commitment seemed overwhelming. Seriously, have you seen some of the homeschool blogs? Oh my… one look and it turned me running in the other direction. How did they have time for ALL of that? Big brother turned five one day and it was time to make a decision about kindergarten. His oldest cousin would be enrolled in our neighborhood elementary school so we decided to send our son as well. My biggest apprehension, however, was that our entire district, the entire city of Des Moines, does not offer one half day kindergarten program. I knew in the deepest of my hearts a full day at five years old would be too much for my son. On the first day of school my heart ached. Big brother cried and didn’t want to let go of me. I know this is normal for many kindergartners, but my son cried for two weeks. I cried at home for two weeks. Little brother was spending his days alone. Big brother would come home absolutely exhausted. One day big brother came home with a fat lip. He was different that day. He acted out in class so I sent him to his room as punishment. While he cried, he muttered, “mama, I scream like a girl!” My heart sank. He dug his head into his pillow and didn’t want to say another word. I pried and pried until he finally told me that a little boy in his class had been bothering him. He knocked him off a slide (where he hit his lip), throwing him to the ground and told him he screams like a girl. Words stick with my son. He’s compassionate and smaller than many boys his age. This hurt him, badly. I started to cry and we immediately went to his school to speak to his teacher and principle. They were absolutely wonderful. His school takes every precaution to enforce non-bullying and spoke to the little boy and his parents the very next day. However, I was still upset that my son had to go through this at five years old. That he had to experience bullying in kindergarten. It was another conviction from the Holy Spirit that I needed to start praying more about homeschool. My son was learning a lot in kindergarten. He’s very intelligent and picks things up quickly. He can memorize things in one day so he was excelling at school. As happy as I was to see how much he was learning I kept my eyes on all of his paperwork he was bringing home. After collecting his paperwork for awhile, I knew I could do this at home. I went back to those homeschool blogs but immediately closed them. It was too much for me at that time and I knew that if I focused on simple teachings, I could homeschool my son. One day, after another rushed morning of trying to get big brother to eat his breakfast, change his clothes, brush his teeth and out the door before 8:10am, he broke down. He started to cry like I’ve never seen him cry before. I started to cry with him. In slowing down and living more simply, homeschooling was the perfect fit for us. We’re able to slow down, eat breakfast at around 8am and start our school day at around 9am. School usually lasts a couple hours a day and we switch things up to make sure we’re having fun and playing when we need to. Big brother still gets his naps, which he needs. It’s been a blessing to see him learn to read, write and think. What I love most is that the boys are learning with a biblical foundation. It’s also been a blessing to see little brother learn along the way as well. In two short months, he recognizes most of his abc’s, is learning his phonics, memorizes scripture, songs and has fun painting right along with big brother. Homeschool just works for our family. I am having the best time with my children and they are enjoying it as well. I’ve committed one year at a time to the Lord and I’m making sure, through prayer, to not get overwhelmed and to take things slowly one day at a time. This was how we started and how we found ourselves on our journey to homeschool. In just these past couple of months, I’ve had people ask me how did I start homeschooling? What am I doing? What does our day look like? I’m obviously no pro but next week I’d like to share how we started without being overwhelmed. It’s the most difficult thing to just start and know how to do that. With so many philosophies, curriculum, and blogs it can be darn right SCARY. So, next week I’ll share on how we started to homeschool… simply, all through prayer and under the Lords direction. It doesn’t have to be overwhelming unless we allow it to be. Great post!! So happy its working for you!! Your story is similar to ours. We have 2 girls and their ages are much different but we have been torn with homeschooling our youngest for a while now. She’s a first grader and I am struggling with the public school system, worldly influences, bullying and the way the school staff has handled it. Thanks for sharing. I plan on keeping up 🙂 we are strongly considering homeschool next year and just taking it a year at a time, as God directs us. That’s great to hear 😀 God is faithful! Thank you for your honest post. We teeter, too. Our oldest will be four in April, and his little brother will be two. As it is, they rarely see other kids because we have no other family in the area. There are many, many children living within a block of hour house but they are all in daycare/preschool during the day. For them it’s supper, a bit of family time, and bed. Every time we walk past a preschool, the kids beg to go play… For the sake of being with other kids we want them to go to school. On the other hand, our oldest reads bedtime stories to US. When we bake together, he reads the ingredients in the recipe. (He is standing here, right now, reading as I type.) How bored would he be in a year and a half, in kindergarten? I also do not want to engage in a battle over food. The local school serves the usual processed slop, the stuff we avoid unless we are traveling. Rural schools use the breakfast and lunch program as fundraisers because income levels are set to a national standard. We all know that the cost of living and wages are lower in rural Iowa, so many more families qualify for “free” meals than really need them. My friends’ kids were bullied by the school to eat “free” meals, even though their mother fed them well, thankyouverymuch. So, do I keep the boys home, or do I throw myself into the school so I can micromanage? I struggled with many of the same issues. There aren’t really any neighborhood kids where we live and in the heart of the city next door neighbors barely even know each other. It’s heartbreaking, really. Meeting nearby homeschool kids big brothers age is one of my prayers right now. However, we do have him involved in baseball, soccer and at the end of this year he’ll start boy scouts. With all of these activities and being active in our church, we’ve found that he has just enough friends to keep him social and he has his cousins which are his very best friends. Maybe some activities and even 4H would be great ways for your children to meet others kids and find playmates. They are still very young and having his brother only two years younger is a huge blessing 🙂 I just love having my two that close in age. They have a constant best friend and learn so well together. In big brothers kindergarten class, he was one of two kids that took a cold lunch to school every day. Every other kids was a part of the school system cafeteria program and yeah… not great healthy choices… at all. What’s really cool is that your son is four right now and you can begin to do homeschool now and see how it goes for you before the coming school year. He sounds so advanced now that he would be bored in kindergarten even first grade, yet too young to be thrown in with second graders. Definitely pray about it and hold true to His convictions. In obedience He’ll be so faithful to give you peace over your decision. Diana…I began homeschooling back in the early 80’s….when homeschooling was a dirty word. We followed Dr. Raymond and Dorothy Moore’s books (they were the grandparents of today’s homeschooling movement)and continued to homeschool to one degree or another until our last one was done 3 years ago. Several years back I read John Taylor Gatto’s book “Dumbing Us Down”. It is THE book I pass along to any parent who is even remotely considering homeschooling. We were fortunate to meet him at a homeschooling conference, and he is even more awesome in person. We followed a literature based homeschooling curriculum, utilizing our local library for many of our textbooks. It has been several years since our homeschooling journey has ended, and though I have several regrets(more math), it is something I would definitely do again. The book is now in my Amazon cart. Thank you for the suggestion! You can do it! I started homeschooling my oldest when she was 5 (now 11) and am homeschooling my middle child, age 5, right now as well. I’ve learned that the best homeschooling approach is the one that fits you! We studied out what our State requires for them to know in order to have good SAT’s and we “git r done”…then, we do the fun stuff! Music, gardening, cooking, painting are biggies with us and I love it that we have TIME to do those things! I’m not saying we don’t get tired and sometimes we question, but then we look at the results in our girls spiritual and physical lives and it’s SO worth it! I love reading your blog everyday and want to encourage you to keep with the homeschooling. The first year or two are the hardest because you’re trying to find what fits you and your kids. Once you find it, it’s great! Hi, I just stumbled into your blog and I am so glad I did. I admire that you instantly listened to your heart. I wish I would have had the courage to have done the same. It was my baby’s first day of 3rd. grade and he broke down crying and asked me not to put him in school and to homeschool him. Well after he expalined why, I wen tto the school and took him ut. Yet, I did not listenn to my heart and put him in another school. Now almost 8 years later he is still struggling and to be honest I think he hates it. He never really did well after that. He just gets by. I think had I taken him out he would have done excellent by me homeschooling and then eventuallly would have entered school, possibly High School. Good for you. God Bless You and always follow your heart. simona, it is never to late to homeschool. i want to encourage you to do what is best for your son, no matter what. our kiddos were in 5th and 3rd respectively when we started. we continued through high school where they both were able to enjoy the journey based on their talents and natural bents. they are now in their early twenties (with one married), continuing their education while they work and are striving to reach their career goals. I am not able to run my business AND homeschool, so I do the next best thing. I make a point to involve myself when I can with my children at public school. I volunteer in the classroom, I have come in as a guest to teach art (something I actually did before I had kids), and I go with the kids on field trips. Because I am self employed, I am also able to walk the kids to and from school everyday, so i get lots of face time with their teachers. My son is a freshman and we have homeschooled/unschooled since 1st grade. The way to start simply is to let go and for the first year just get your kids excited about learning! What a wonderful post and it confirmed what I already new deep in my heart (especially after reading about the choking incident). My blog will never be more than a place to be creative, share info and recipes, and chronicle our lives. My youngest son(3) was diagnosed with cancer last fall, endured chemo brilliantly well, and is now in remission. Life is just to precious to be BUSY (your acronym is going on my fridge as a reminder). Wow Megan. Thank you for sharing and keeping things in perspective. I’m so glad to hear that your little boy is in remission. Makes you realize what’s truly important, huh?! Sweet blessings to you and your family. I have 3 kids that I home school. They are 12, 9 and 7. It seems as though you are on the right track. I was a wreck my first year too and put a lot more work on myself than necessary for teaching one 1st grader. We have a support group in our area that often does field trips. I was so uptight that, although I would have loved to go see the ice cream factory or other such things, I wouldn’t go because, “we’re not studying that right now and I don’t want to get off focus”. Good Grief!!! Now, I would just say, “So what that we’re studying Hitler, going to the ice cream factory sounds like a lot of fun and we’ll pick up where we left off on the next day.” I do still get a bit worked up and worried about some things. Now that my oldest is in “jr. high” I worry that she hasn’t done enough writing or that we’ve missed some other things along the way. When I get like that, I have to remember to pray and ask God if He is guiding me to some other curriculum or to add something on, or am I just putting pressure on myself because I’m playing the comparison game. I always have to remember that I do not know what my children will be doing as adults, but God does. If I continually put their education needs before Him, He will be faithful to guide me/us. Good Luck to you and God bless you on your Home school journey. Thanks for sharing that Michelle. I do agree, we just try to take things easily. Not too much to overwhelm myself or the kids. That’s great to hear! I feel so blessed to be traveling this path with you. It is so amazing when we take the blinders off and see homeschooling for what it is, not what we thought it would or should be. I agree with the previous poster about reading “Dumbing Us Down” when you are starting out. It sealed the deal for us. 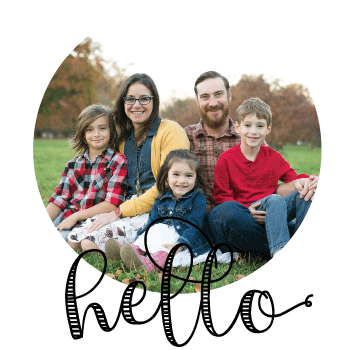 We started out with a couple of reasons and a feeling that the Holy Spirit was leading us to homeschooling but since starting 3 years ago we have added so many more reasons to why and the Holy Spirit has CONVICTED us to this lifestyle. Like we talked about last week, you do have to step away from the overwhelming blogs that make it look like so much more than the reality of it. You do what feels right for your family and you make changes as you go. You have the freedom to choose. One more thought about starting out and not being overwhelmed. In Iowa through 5th grade we only have to assess reading, writing, and math. Stick with those basic subjects when you are first beginning and the rest will happen without you even trying. Gardening, field trips, home projects, raising caterpillars, etc. When the kids are young those things are science and social studies at their very best! Thank you for letting me be a part of your journey. I look forward to getting to know you and your family better along the way. Have fun and thank God for bringing you to this amazing life! Thank you Maria! I’m so blessed to know you in real life!! Huge hugs! I home school my 3 children and I currently teach a 9th grader, 7th grader, and learning disabled Kindergartener. I feel that the best thing you can do is relax and don’t try to make a rigid schedule. Remember that you are at home and if a little one needs a break or is distracted, it is okay. For little ones it is important to find activities that they think are fun and if you can get some good learning cds those are great too. My daughter learns to remember things easier if they are in a fun song format. We all learned the abc song and it helped us remember the letters. There is a wealth of such cds out there to use. Allow them to do some things at home that they were not allowed to do in public school (this has helped with transitioning my older kids) such as chew gum or wear pajamas one day. It is great that you are starting your day with them a bit later. I feel that public school kids have to get up too early and it affects their attention at school. I have found some great posters at the local dollar store with the abc and numbers on them and it is a good idea to make these visible on the wall. It sounds like you are doing a great job! And I definitely wanted to raise my hand and yell “Me too!” when you mentioned the half-day kindergarten. She really still needed naps at that age. Even at 9, school days are long for her and she is pretty wiped out and agitated by the time she gets home, does homework, eats supper, practices piano, and we could really use a shorter school day, even now. She has a bit of a defiant streak. She has been in counseling to help get it under control. I’ve always been interested in homeschooling – we live in a very homeschool-friendly town. But right now, the public school is the place for her while she learns how to better control herself. I know she would be too challenging for me (full time) at this time. I think her and I have a unspoken, mutual goal, though, for me to eventually homeschool her come middle school(and her sister.) Because my oldest is gifted, it is hard for the school to keep her challenged (she is even outpacing the gifted/talented program.) She is in 3rd grade and all of the library books at her elementary school are too easy for her. So if we choose to homeschool – because we would let her go at her pace – it will more-than-likely be though high school when she get get more challenged again with AP classes and college PSEO courses. I am certainly not bragging about having a gifted kid. It’s tough. The hardest thing for her is she expects everything to come easy for herself and that nothing that takes work to do is really worth doing, anyway, and already thinks we are complete morons. (haha) I guess I’m really struggling with it. (and just wait till she is learning material I don’t even know – like calculus!) If you or your readers feel led to pray for wisdom in our situation, we would gladly welcome that. Father, I pray for Jenny right now and that you would be able to give her the wisdom she needs to making a decision regarding her girls and homeschooling. I pray that Jenny would come to you, our might counselor, to let her know what’s causing defiance in her daughters life. That she would be able to be a part of her daughters life in every situation regardless if she homeschool’s or not.I praise you Lord that you have given her intelligent young girls and that you would keep them in your constant arm, safe and pure. In Jesus name, amen. Jenny, thank you so much for your comment. Lean onto God, pray and get into His word. Let God fill you with His Holy Spirit to give you the wisdom you need and let Him direct your path. It’s so tough, huh?! Either way, I do know from experienced home school moms, that the older they get the easier it can become. Especially when they are in high school and doing so much self teaching. Which in all reality, is the best way for adults to learn in order to create a constant thirst for knowledge… true knowledge. I agree with your comments on self-learning. I think she really is one – which is why she hates it when I “teach” her less-concrete things such as character qualities, social norms and things like that. I’ve heard a lot about the computer-based teaching, though I’m not crazy about all the time in front of a screen, like your whole post was about, it would definitely be our baby step getting started with homeschooling – and it would be the only way I would (or could) teach math – which is her strongest subject. I had a hard time reading this. A serious question…how can your daughter’s school teach her self control? That is sort of like saying, “I’ll come to Jesus when I get my life straightened out”. God gave you your daughter to train, He didn’t give them to the teachers. This is NOT meant in nasty at all!! I think most people are so entrapped by the world’s ways that they don’t see the error in it. I love the analogy I heard years ago…”Does a fish know it’s wet?” If we are born right into sin and live in it every day, like a fish is born in water and lives in it every day, do we know when we are sinning? NO, I don’t mean sending children to school is a sin, but do we know when we are following the world’s ways, and not God’s ways? I wish I could say that the start of homeschooling as been like yours, but it has been hard. I am doing the Sonlight with Naomi… good stuff, but what’s difficult is trying to keep it simple, fun and creative. The only thing we enjoy doing together is reading. LOTS of reading. I don’t have a “school” room where I can hang up stuff and show a progress chart (like what you have going in your basement). I don’t have room anywhere in this house for that. I can’t tell you how many times I’ve cried out to the Lord for wisdom and patient. There are days where I just don’t like homeschooling. Sigh. Please pray for me amiga! I want to like it and I want to make good memories. So happy to hear this news, Diana! You are right where the Lord wants you–and the way you are starting is perfect. Keep it simple, and keep trusting. And when you need a little encouragement, don’t forget your friends who’ve been on this road a while–they are a good resource! There are a few of us in this neighborhood–feel free to call any time! My kids aren’t in school yet, but I just started looking into 1/2 day preschool for our soon 3 year old. Luckily we have 1/2 day preschool and kindergarden and a great small church school in our town. You are doing the right thing by trusting in Our Lord first. And keeping things simple, little by little. It is overwhelming with so many books, blogs, homeschool co-ops, curriculum available now a days. Taking it one year a time is what we did, and now we have a senior in the house. I enjoyed reading your journey to home school Diana. I was so heart-warmed to read of your eldest little one and how instead of the worlds way (telling a child to hit back, etc)you cradled him and recognized his needs, your child’s needs, which are the simplest of all, to be loved by mom and dad, and to learn and grow in a loving, healthy home. I call that ‘sheltering’, I see it as this, we are sheltered by our God with His laws, and His Spirit, and this protects us, and gives us wisdom. As parents, I feel our greatest job is to ‘shelter’ our little ones and give them our best. Proverbs 22:6 says it best, “Train up a child in the way he should go: and when he is old, he will not depart from it.” Diana, you have wisdom and insight that will be very valuable to pass on to your little men. My little girl is now a 25 year old young woman, married this past November. I prayed daily for her while she was growing up and was able to bring her home to school in grade 5 when she became ill with shingles (yes in grade 5!). She was a joy and a delight to raise and I am thrilled with her choice of partner for life. Was the road I chose for her the easiest?…..not by a long shot, but with prayer, and my Savior, we made it through. I actually home schooled her all the way through high school. Don’t give up on the home school blogs, glean what you can from them for when your little men are older. Now is a good time to bask in the glorious gift they are to both you and your dear husband and to lay the groundwork for the Godly young men they will become. It’s never to early to start praying for a faithful, Godly wife for your little men. As a note, after beginning our home school journey, I found a local support group of other believing parents and as our children grew, we were able to offer all kinds of wonderful experiences that they simply did not have afforded to them in public school. I have now watched with wonder as all these children have grown into wonderful young adults, some married, some not quite married, some raising children, some not yet. All in all, a great group of friends and young adults scattered to the far reaches of our great earth. I wish you (and everyone else that reads this) well in your journey and I wish you and your family peace. We love the lifestyle and I have to brag — my senior in high school recently wrote to us as parents. She said that homeschooling was ingenious in that we were able to practice and live our faith in a natural way. She thanked and affirmed the decision we made many years ago to keep her at home, next to her siblings, teaching her life skills and a little school, too. Blessings to your family! I loved reading your story, Diana! I’ve been homeschooling for 9 years now, my children are 14, 11, 9, and 7. I don’t regret ONE MINUTE. Leave the blogs behind for now at least. (I don’t read a single one) Keep things simple-Ruth Beechick’s Three R’s booklets may be helpful for you. The biggest thing to remember is not to let yourself get overwhelmed by all the fabulous resources out there. :~) We have a lot of choices today, but God will lead you-keep praying and listening. Thank you for your post. Reading it felt like it was telling our story and experience.